Designing prototypes, digital products and design systems, which are smart, beautiful and easy to use. I worked for many leading brands, including Zalando SE (at Berlin HQ), Commune Hotels & Resorts (at Bali HQ), Yamaha, T-Mobile, Ahold, W Hotels & Resorts, Royal FloraHolland, Greenchoice, Boldking and many more. And for non-profit institutions, like Eye Film Institute, University of Amsterdam, City of Amsterdam and Dutch Chamber of Commerce. I have also collaborated with several design and internet agencies, for example Chunk, INDG, Fabrique, Vandejong, Motorrr, Qikker Online, Lucas & Mallee, Aiden and 09:30. And proud co-founder of a new company called The Master Workshop; we invite inspiring speakers from all over the world teaching about #emotionaldesign, #empathy, and #digitalethics to facilitate 8-hour long Master Workshops. 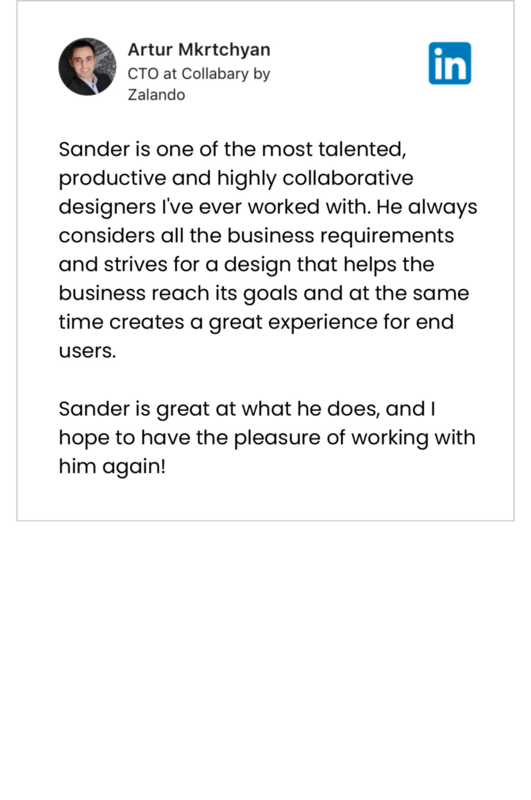 According to Adobe and Shopify I'm one of 10 UX designers to follow on Instagram for inspiration, who are contributing valuable and inspiring content to the design community. Eye Film Institute — Designing the new website (IA + UX + UI) of the national museum for film in the Netherlands, with new modular grid & design system + headless CMS. Zalando SE — Redesign (IA + UX + UI) of a digital product called Collabary; an influencer marketing start-up of a world-famous e-commerce company. This is my current talk. In it I cover how you can discover how your users really feel about your digital products. Humans are driven by emotions, so instead of listening to what people say about your product, we can now also see what their emotions are. I showcase how a sales funnel prototype I designed for T-Mobile was tested with a neurofeedback usability test. What the results were of this test and how I applied these learnings in the final design. Which elements cause frustration, attention, and joy among the customers? Specialised in design sprints and in the design thinking, lean start-up and scrum methodologies. Plus an expert in online accessibility (WCAG 2.0). Helping companies with their digital transformation while guiding stakeholders during the process. Doing this by facilitating workshops, gathering and analysing input (internal and external), leading teams, defining roadmaps and giving presentations. Designing modern UX and UI, like responsive & mobile websites, (web)apps & webtools, modular grid systems, voice & text interfaces, and design systems. I am passionate about designing smart information architecture (UX) as well as well-functioning and beautiful user interfaces (UI). In order to enhance my productivity and allow for experiencing the end product in an early wireframe phase, I design them both at the same time. For this purpose, I develop click demos during the design process. In need of an UX training or Design Thinking workshop facilitator? We invite inspiring speakers from all over the world teaching about #emotionaldesign, #empathy, and #digitalethics to facilitate 8-hour long Master Workshops.